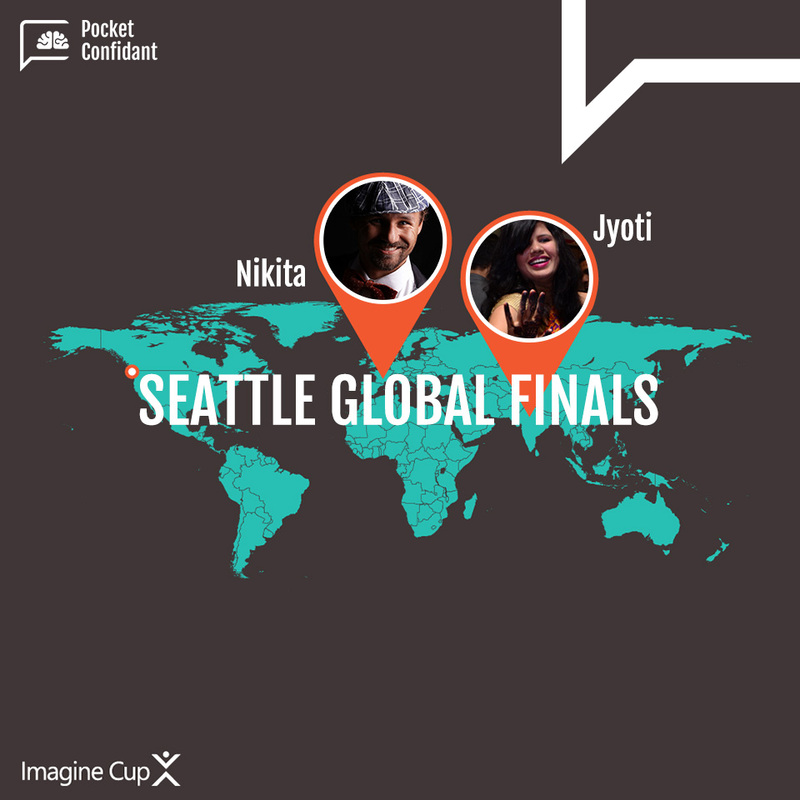 After being in the Top 3 in Microsoft’s Imagine Cup Finals in New Delhi, India, in February 2017, PocketConfidant’s technical members – Jyoti Mishra and Nikita Lukianets – are competing in the Worldwide Finals of Microsoft Imagine Cup which takes place in Seattle July 24th and 25th 2017. Imagine Cup is an inspiring initiative where teams search for solutions to the world’s toughest problems. We are very happy to have Jyoti Mishra and Nikita Lukianets represent PocketConfidant AI in the US. We wanted to share some insights from our team’s vision, to have you understand who we are and how we see our journey. You can read our first article interviewing Jyoti Mishra, our Natural Language Processing Engineer, about her vision and experience in the Imagine Cup competition. Here, we wanted to share thoughts and perceptions of Nikita Lukianets and how they guide his role as a CTO of PocketConfidant AI. Nikita, what do you want to achieve by participating in the Imagine Cup? Imagine Cup has the reputation of being one of the strongest student competitions for innovative projects in the field of computer science and program engineering. Being part of it is already an achievement. Getting shortlisted in the national finals in India was an important step for the validation of our idea. Becoming one of the winners of the Imagine Cup India meant being recognized by experts who believed in our idea and execution; it was a confirmation that our efforts are noticed. Finally, we are among those teams which are ready for big changes and are interested in addressing global challenges both technically and business-wise. Now, reaching the top 50 projects on the global scale is the opportunity for the PocketConfidant team to have our voice heard by industry leaders, executives, and innovators. Of course, my vision of participation in Imagine Cup evolves: from the basic desire to validate our idea of delivering self-coaching through an AI assistant, to more forward-looking desires related to building partnership ecosystems with other start-up projects and with well-established businesses. The basic motivation for me is always curiosity, and a wish to experiment, to test to see if thoughts work and ideas resonate with others. Significant change cannot happen on its own, in isolation, it requires many people to believe in it and to start building things together. I see Imagine Cup as a platform for exploration, a gold mine in this context. Imagine Cup is a team game. Is it easy to work as a team? Doing something meaningful and unique has never been easy. Imagine Cup competition is very close to the real business environment: you need diverse expertise and talent in your team. Working as a team is a choice and I am happy that I understood earlier in my career that the success of an idea requires a multi-factored solution. Success lies not only in the technical realization, but also heavily on the ability to bring the idea to the market, to build and maintain the team and the ability of the team to self-sustain financially over a long period of time. The team is a living organism with its growth stages, age-related diseases, and importantly, its soul. The soul of the team is intermingled with the team’s motivation, its reason to exist. When difficulties emerge, we learned to come back to our vision and values to cope with them and align. As we are building a self-coaching technology, we should be the coaches ourselves. We learn and teach ourselves to ask questions, challenge our assumptions and improve our communication style to understand each other better. Building a startup is like drawing an optimal path in a multi-dimensional space of skills. It is a real adventure that requires wearing multiple hats. As a CTO, I sometimes wear the hat of a designer when it comes to building user experience for our product. Sometimes, I wear the hat of a data scientist – a fundamental engineering background is valuable when questioning our approach and making data-driven decisions. Sometimes, I have to wear the hat of an innovation manager – here I draw on my MBA experience to structure our business goals and define the processes inside the team. As our team is getting ready to grow, I am learning to manage software development in a ‘distributed-first’ team. In dynamic environments like ours, people are always more important than processes. It is people who are the driving force of change and innovation. Overall, right now I see that my biggest priority is in building a strong user-oriented product team. I have a dream to attract, challenge and unite people stronger than I am, to work together on our mission. You will be in Seattle; do you plan any other activity apart from participation in the Imagine Cup? Obviously, successful participation in the Imagine Cup finals is the main goal for our team and we are extremely determined to showcase what we’ve been working on. I will be in Seattle for the first time and I want to take this opportunity seriously. Seattle is home for many outstanding organizations that have been able to innovate over a long period of time: Boeing, Microsoft, Allen’s Institute of Brain Science. I believe that exploring the nature of their environment and meeting people from these companies would play well for our team.